"Why go to Israel?" Perhaps you've asked yourself that question before or someone else has asked it of you. If you have been to Israel (or live there now) then you can probably think of several reasons why someone should go. But for someone who has never been, this is a valid question. After all, for most people in the world, it is a serious investment of time and money (and a certain amount of risk) to travel to the Holy Land. Why go through all the trouble? My favorite way to answer that question is to tell people that the Bible comes alive and somehow becomes more real when you go to Israel or any of the other lands of the Bible. From our armchairs in what the Bible refers to as the "ends of the earth" (Acts 1:8), it is all too easy to fall into the trap of reading the Bible like you would read a fictional book. Even if you believe every word is true, those times and places are so far removed from your everyday life that it is difficult to remember that the heroes in the Bible were real people who faced real challenges and who had to exercise real faith. However, traveling to biblical lands removes much of distance between you and the people in the Bible. You see the biblical places with your own eyes and you become aware that you are standing in the same spot as David or Ruth or whomever. Suddenly it hits you ... "This is where it happened!" ... and a biblical story will jump off the page into real life. In my experience, such moments happen in different places for different people when they visit Israel. Our picture of the week is of one of the places where it happened to me. It comes from Volume 1 of the Pictorial Library of Bible Lands which focuses on Galilee. It is a photograph of the High Place at Dan. In the foreground is a reconstruction of a horned altar that once stood at that spot, and behind it are steps leading up to an elevated platform where one of Jeroboam's golden calves once stood. 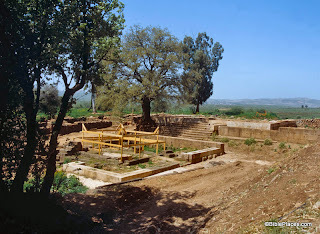 I was familiar with the story of Jeroboam's idolatry when I first visited the site and could even point out for you on a map where Dan and Bethel were, the two places where Jeroboam erected golden calves for the Israelites to worship. But it wasn't until I was standing there, close to the spot where this picture was taken, that I ever stopped to think that there was an actual place on the globe where a golden calf had stood and where sacrifices were offered to it. The absolute certainty of the place drove home to me the reality of 1 Kings 12:26-30. So why go to Israel? Well, for one thing, the Bible will come alive for you in ways you don't expect. This photograph and over 1,100 others are available in Volume 1 of the Pictorial Libary of Bible Lands which is available here for $39 (with free shipping). Additional photographs of Tel Dan and links to more information about the site can be found on the BiblePlaces website here. Seth, you nailed it. There's really nothing that can compare to seeing the Bible "in context." Thanks for affirming that again for us.